Statistics or the science of data is a major course in the field of mathematics. Topics may include Data Classification and Experimental Design; Probability; Probability Distributions(Discrete and Normal); Confidence Intervals; Hypothesis Testing and Regression. Math Tutoring Experts specializes in assisting students with these types of topics in the field of statistics. Students often struggle with statistics due to the vast number of different formulas that exists for this course. Finding the mean, median and mode and distinguishing between different types of graphs such as histograms, boxplots, and stem and leaf plots are also difficulties that students often have. Lastly, one other problem that often arises is the inability to properly read statistical tables such as the Z table,T table, Random Binomial Chart, and Chi Square Table. Math tutoring experts is your trusted source for assistance with statistics. Tutoring sessions are provided during the evenings and weekends. Along with regular tutoring sessions, MTE also provides group packaging sessions for students who need assistance with certain topics such as Probability; Normal Distributions; Hypothesis Testing. 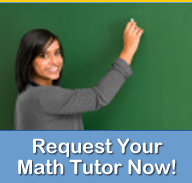 Math tutoring experts also provides assistance with using the TI 83 calculator and Microsoft Excel 2007. These tools are essential for success with this databased course. Contact us today to start your sessions with the experts!